I’ve tried winning PlayerUnknown’s Battlegrounds matches with pacifism. I’ve tried hiding out, talking to other players, and (very unsuccessfully) blocking bullets with a frying pan. I never believed it was actually possible, though. Eventually death—aka the ever-encroaching blue fog of doom—claims us all. Against all odds, however, Kurtjmac and a partner pulled it off. They spent most of the match hiding in buildings, driving, and staying on the outside edge of the circle. A handful of people tried to shoot at them, but they employed the time-honored pacifist strategy of conscientious objection, which is what I call leaping into a car and speeding away like a dang volcano’s erupting. Fast forward to 03:46:30 for the beginning of the match and 04:22:00 for the big win. Things got interesting toward the end of the match. As the number of players dwindled from 20 to 10 to even less than that, the circle closed. 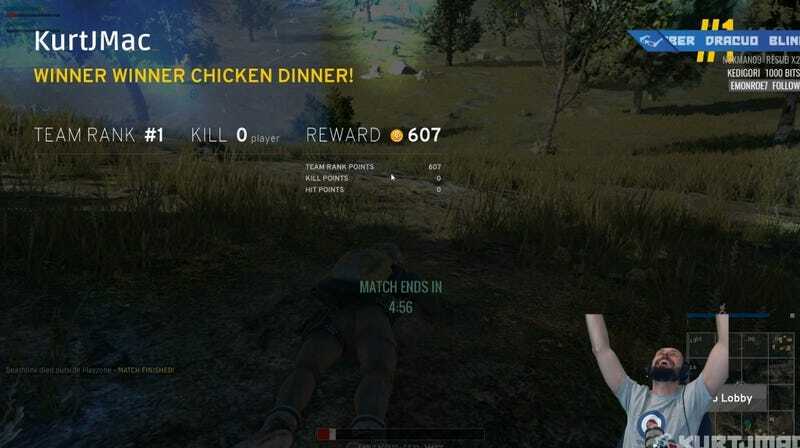 Kurtjmac and his partner hid decently (except for when they accidentally threw a smoke grenade over a hill and into the deadly unknown), but the circle forced them to repeatedly re-position. “I have no idea what the end game strategy is here,” said his partner. “Everybody keeps asking me that, like they think that I’ve thought this through,” chuckled Kurtjmac. Then the circle shrank to its final, extremely enclosed phase. Kurtjmac and his partner hunkered down in tall grass and then realized that, improbably, there was only one other player besides them left. Faced with this fact, the other player hid. For all they knew, they were up against superior numbers and firepower. They had no clue that if they sprang into action, their foes would do absolutely nothing. After a minute or so of waiting, Kurtjmac started lobbing smoke grenades just sort of... around. Still, nothing. Kurtjmac wondered aloud if this other person, too, was trying to win a match without a drop of blood on his hands. Then the circle began to close, meaning that nowhere would be safe. Kurtjmac tried to bandage himself, to stay up a bit longer while being eaten alive by what can only be described as an electric boogaloo. It seemed, though, that his end was nigh. He had just a sliver of health left. Then the win screen appeared. “A bloodless chicken dinner,” said his partner, almost reverently. For both of them, it was actually their first win. Their first chicken dinner.